Japanese Prime Minister Shinzo Abe, right, and Chinese Premier Li Keqiang during a welcome ceremony at the Great Hall of the People in Beijing, Oct. 26, 2018 (AP photo by Andy Wong). The atmosphere during Prime Minister Shinzo Abe’s rare visit to China last week, the first by a Japanese leader since 2011, was loaded with historical meaning. 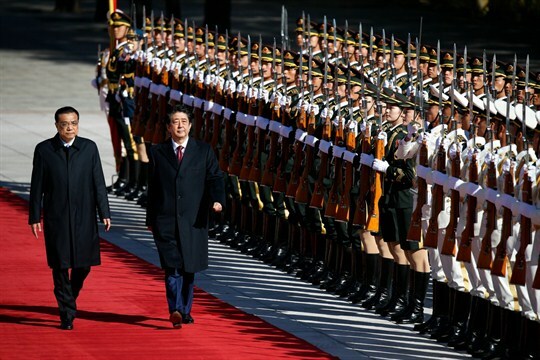 Oct. 23, two days before Abe arrived in Beijing, was the 40th anniversary of the two countries’ Treaty of Peace and Friendship coming into effect. That agreement formally ended their state of war.